Our love for great design and the natural world can be seen in the beauty and warmth of the products we make and the materials we use. 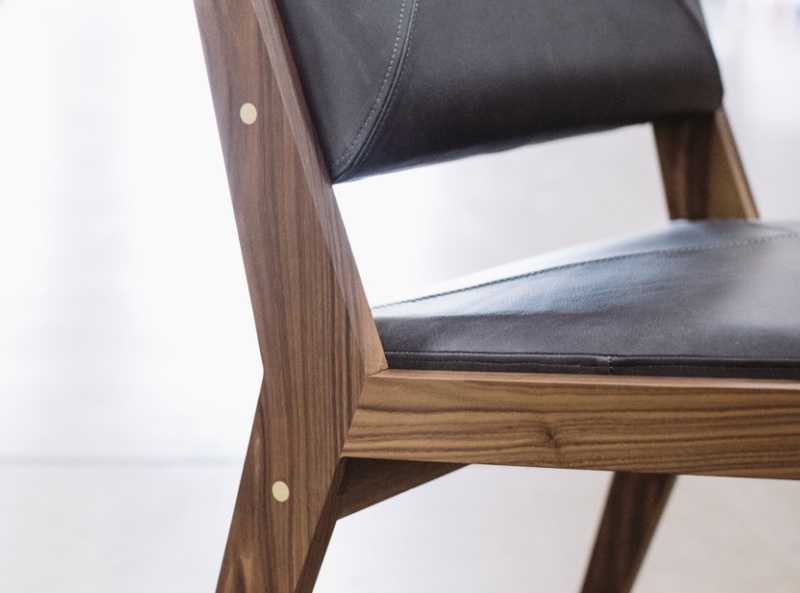 Every material that goes into our products is carefully considered for quality, durability, and character. Our American hardwoods, metals, concrete, and textiles are all responsibly-produced and locally assembled into high-quality furniture. 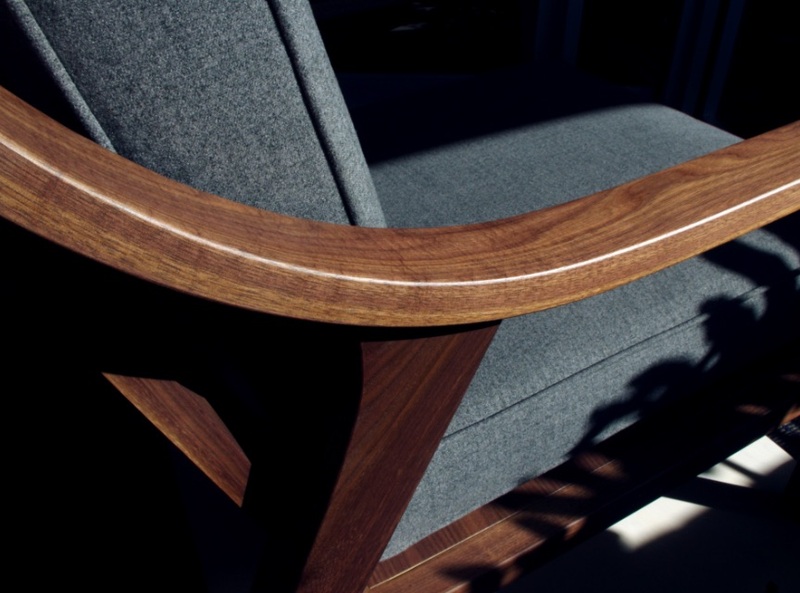 Our products are crafted from American White Oak and American Black Walnut. These quintessential hardwoods are considered among the most durable. We elevate the under-utilized parts of the tree, focusing on character, durability, and beauty. We find value in the imperfections and use these cuts in a way that highlights the wood’s natural appeal. Our region is net positive in tree harvesting and we take care in our sourcing to see that nothing goes to waste. 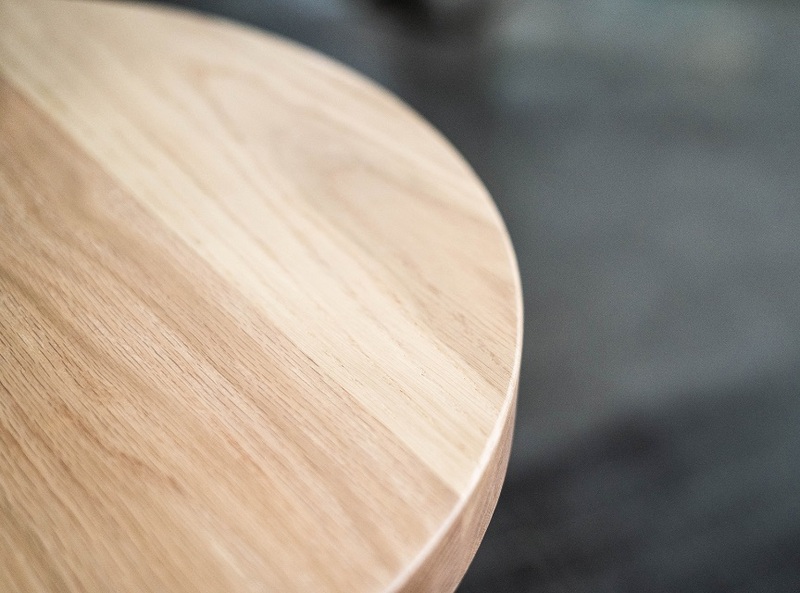 A classic material in American design, American White Oak is durable, easy to work, and naturally beautiful. Our cut highlights the wood’s natural character variations, and also reduces the amount of twisting, warping, and cupping. It’s available in our widest range of in-house finishes and with resawn texture or sanded smooth. 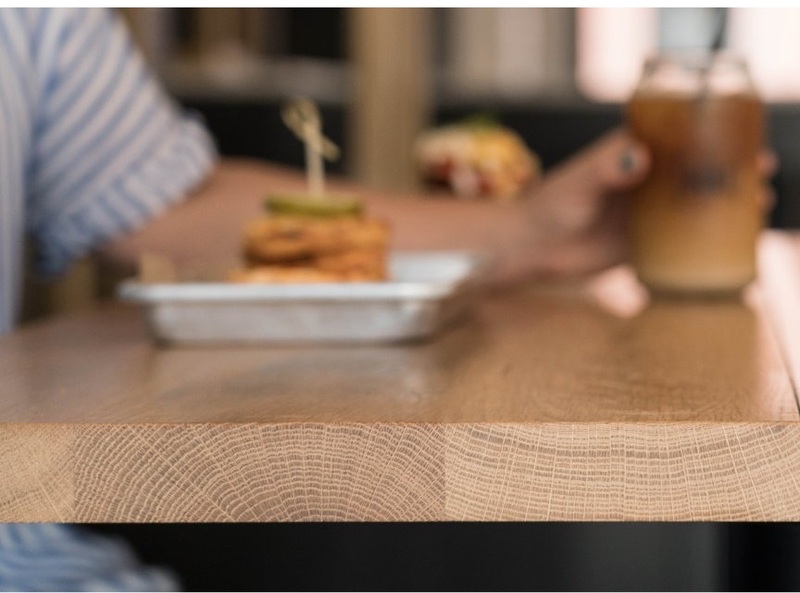 Prized for its color, strength, and grain, American Black Walnut ranges from a creamy blonde color to dark chocolate brown due to the variation between sapwood and heartwood. It is available sanded smooth in our Natural finish. Both our American White Oak and American Black Walnut are sealed on all sides with a solution that is incredibly durable, non-sticky, and UV resistant. This makes our products built-to-last as well as easy to clean. Our signature finishes complement and emphasize the natural beauty and color of the wood. 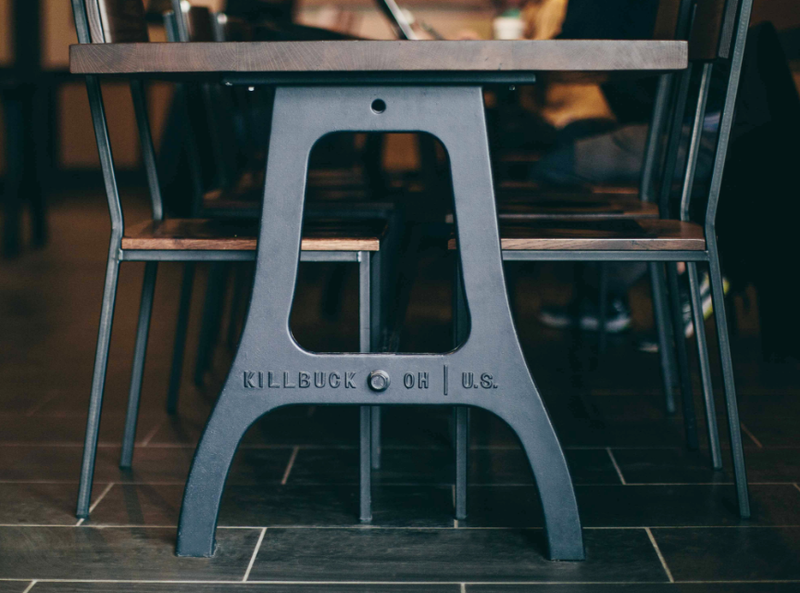 We use hot and cold rolled steel, and cast aluminum throughout our product line and most custom work. Each of these materials have been selected for their strength and durability and can be easily tailored with powder coated color options. We utilize cold rolled and hot rolled steel depending on the needs of the design. Both methods produce made-to-last products that can be easily customized. 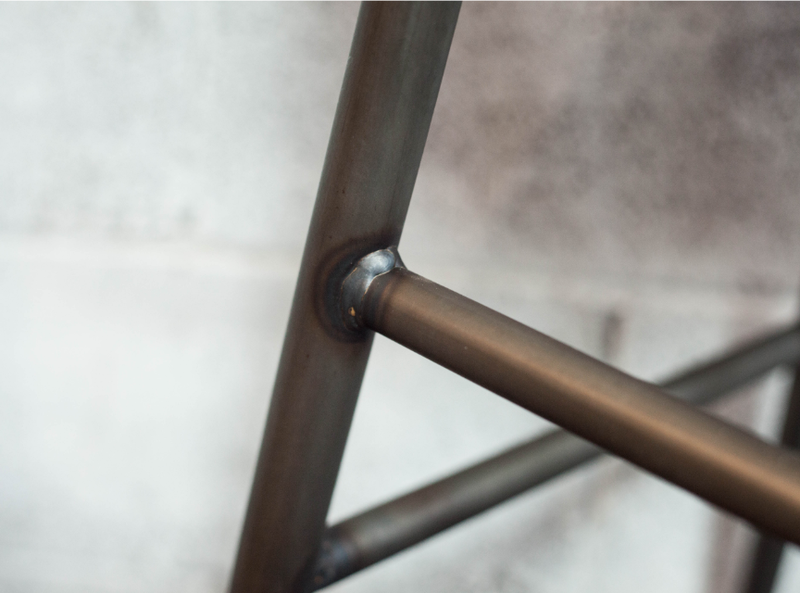 Steel can be cut and welded for versatile use. We hand pour our aluminum using a sand-casting method, an old-world technique that increases its uniformity and durability. Our lightest weight metal option, cast aluminum is the perfect blend of portability and strength. Our concrete is made from our custom mix, then finished and sealed to ensure it’s suitable for heavy commercial use. Concrete is weather-proof, making it appropriate for both indoor and outdoor use. Since every table top is poured by hand, each piece is unique with slight variations. Finished in Warm Gray, it easily achieves a modern and minimalist look. With our custom capabilities, we can use virtually any COM or COL textile to create products that meet our clients’ exact specifications. Our collection features a library of leather and performance fabrics, which are high-quality and designed for commercial use. 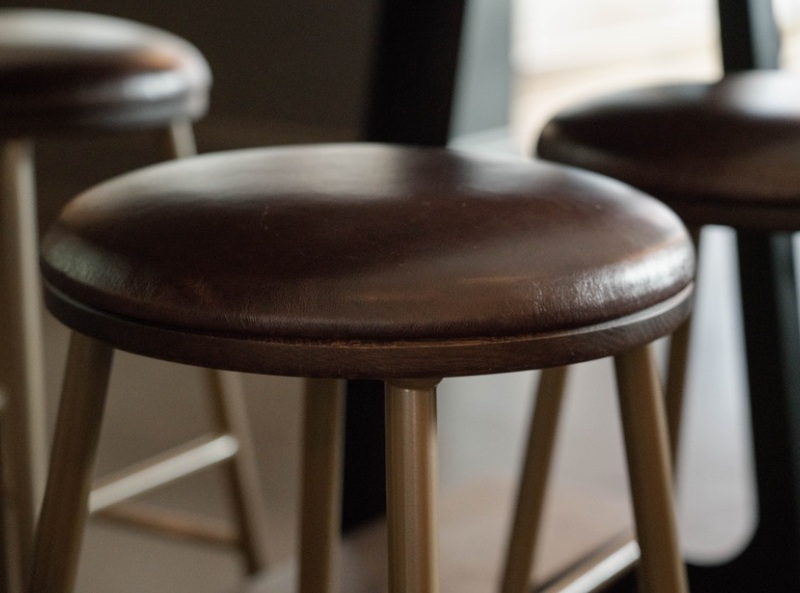 Our full-grain leather is sealed using Crypton® technology to ensure it resists moisture, stains, and odors. Using a pure aniline dye our leather has a waxy, lightly-distressed finish that highlights and protect the natural texture of the hide. Developed for commercial use, our performance fabrics are tough, easy to clean, and abrasion-resistant. These materials provide our products a range of texture and color options.